Figure 1: Volume renderings of temperature, a proxy for ions, and density show ions reflected from the bow shock leading to wave formation in the ion fore-shock. The wavefronts are advected back into the shock, which in turn drives slow large amplitude structures(SLAMS), ultra-low frequency (ULF) waves, and jets. All of which can have significant impact on the Earth’s upper atmosphere. Figure 2: A massive solar flare narrowly missed the Earth in 2012. 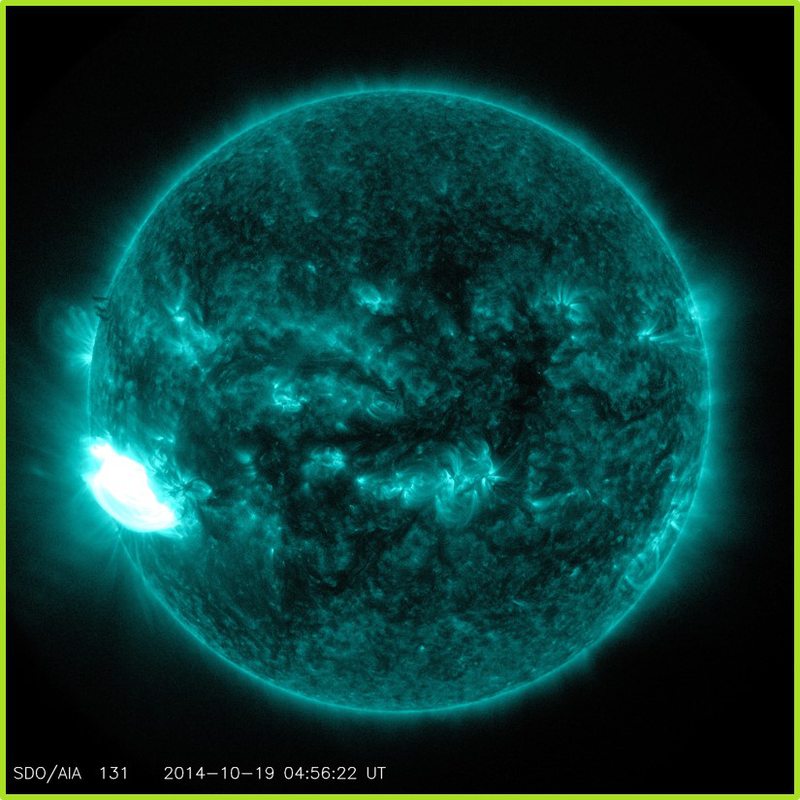 Space weather poses a serious threat to our society which is increasingly reliant on technological systems that are easily damaged by solar storms. For example our power grids and communication and GPS satellites are all susceptible. On September 1 and 2, 1859 the largest solar storm on record occurred, damaging telegraph systems and creating aurora as far south as the Caribbean. On March 13, 1989 a much smaller storm caused a catastrophic collapse of the entire power grid in Quebec and widespread blackout along east coast of U.S. Dangerous There is a 12% chance in the next 10 years of a solar storm of the magnitude of the 1859 Solar super-storm hitting the Earth. It is estimated that such a storm would cause over $2 trillion in damage. Storms can occur even during “very quiet” portion of a modest solar activity cycle. Our society narrowly averted on 23-24 July, 2012 (by a margin of 7 days) a geomagnetic storm as large as the 1859 super-storm. Figure 3: The Ion fore-shock region. 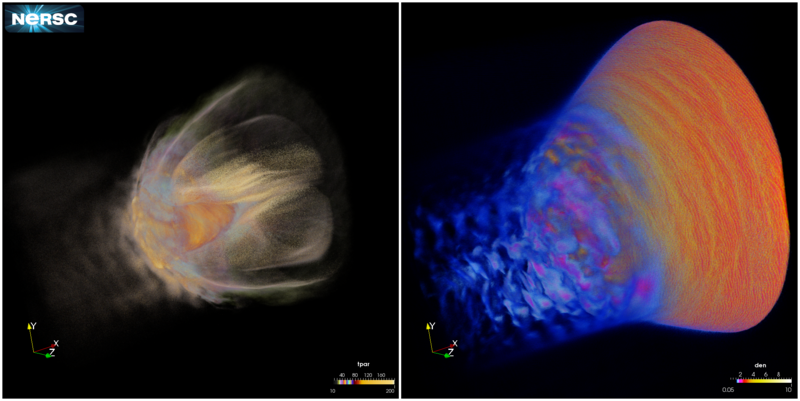 This research leverages petascale simulations of the Earth’s magnetosphere to study the physics and dynamics of space weather phenomenon. A radial interplanetary magnetic field(IMF) configuration was studied. Such configurations are common during high intensity solar storms when the solar wind becomes highly turbulent. In this configuration the ion-foreshock was seen to be highly active. 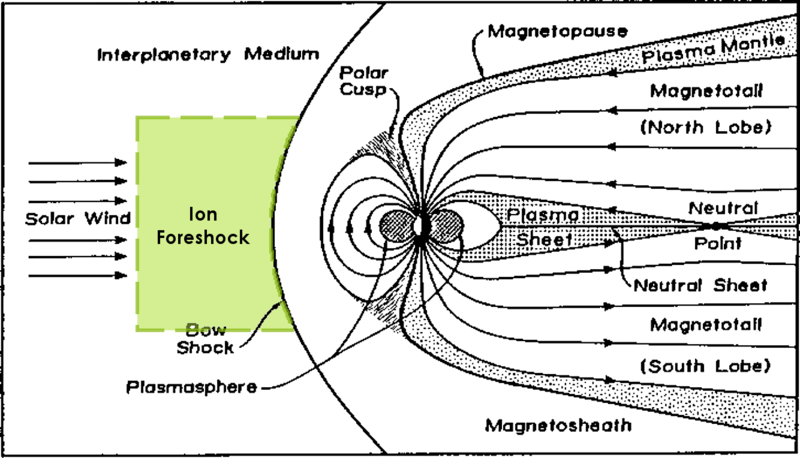 The ion fore-shock is a region in the solar wind magnetically connected to the Earths bow shock where ions with a range of energies streaming against the solar wind flow, generate instabilities and perturbations that ultimately affect the Earths magnetosphere. 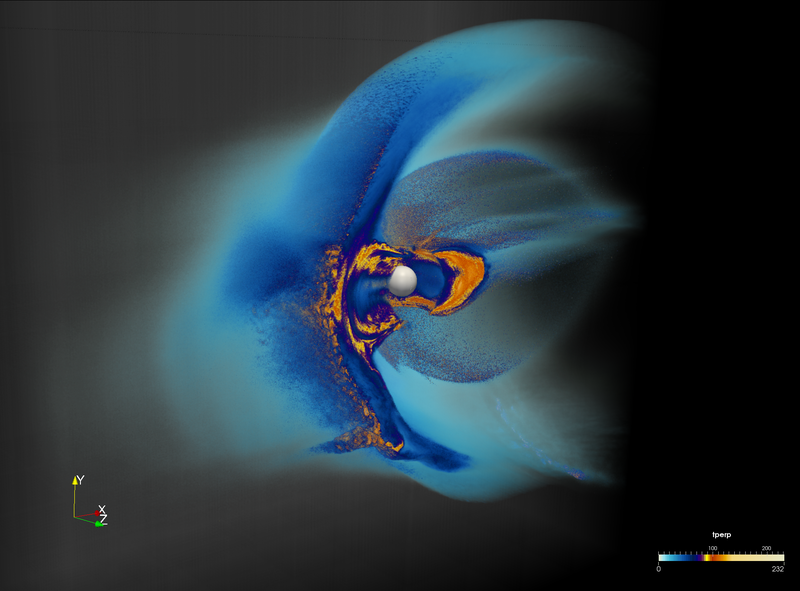 The study is based upon one of the largest global simulations of the Earths magnetosphere ever made. The simulation ran on 150,000 cores for 368 hours, for a total of approximately 55.2 Million core hours. The fields and derived quantities are kept on a 1024x2048x1024 grid, and 1 Trillion Particles were simulated. The simulation produced more that 128 TB of analysis data. The NERSC DAS group applied parallel visualization and analysis techniques using ParaView, VTK, and POVRay. Including interactive and batch volume rendering on Edison using ParaView on 256 cores, and batch mode ray tracing using POV-Ray on 36,000 cores. The Earth is much more exposed to space weather effects than previously thought. Analysis of the simulation data revealed many unexpected results. For example unforeseen phenomenon originating from the ion fore-shock such as Jets, Sunward flow, shocklets, and Short Large Amplitude Magnetic Structures were located and analyzed. The analysis showed marked differences in dynamics compared to recent 2d simulations. 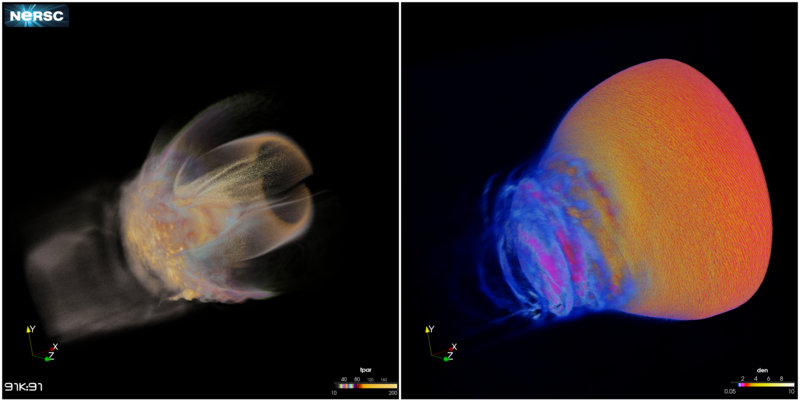 Volume rendering revealed helical 3d wavefronts forming as the reflected ions are picked up by the solar wind, which persists for long times and break down into more turbulent waves which are advected into the bow shock. These waves can then penetrate bow shock and propagate throughout the magnetosphere, extending all the way to the magnetotail. This work is being prepared for publication. Figure 4: A large jet, creating a direct connection between the solar wind and the Magnetosphere, can be seen forming in the temperature signature. H. Karimabadi, V. Roytershteyn, H. X. Vu, Y. A. Omelchenko, J. Scudder, W. Daughton, A. Dimmock, K. Nykyri, M. Wan, D. Sibeck, M. Tatineni, A. Majumdar, B. Loring, and B. Geveci. The link between shocks, turbulence, and magnetic reconnection in collisionless plasmas. Physics of Plasmas (1994-present), 21(6):–, 2014.